It's a near-universal fact. December gets, you know, a little busy, what with the holidays, the end of the year, final exams, final presentations at work, pop-up markets and cookie trucks, and a whole lot of shopping, cooking, and eating that always accompany the last month of the old year. In the midst of the madness, you may feel that you need to treat yourself to a little luxury, or at least a little great food, which is where this dish comes in to save the day. 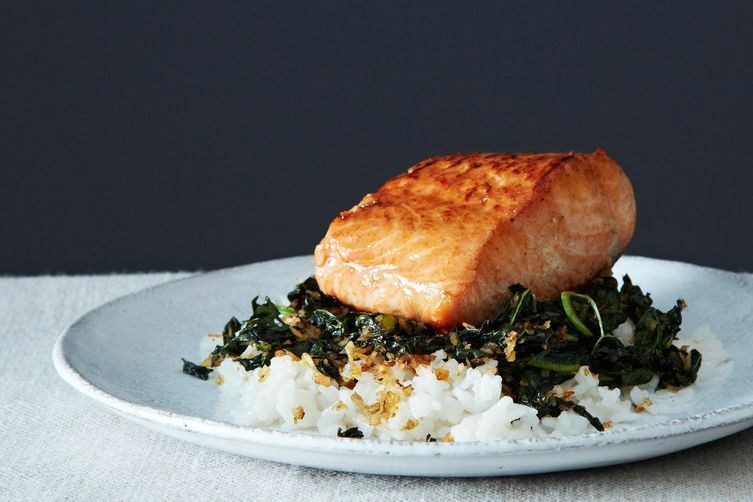 Crispy coconut kale with roasted salmon and coconut rice is a dish that sounds like a mouthful but comes together in under an hour. It's full of good things, slightly sweet, slightly crispy, and the sweet potatoes cement it as the perfect colorful antidote to heavy stews, chilly tiled floors, and waking up to discover all your favorite wool socks need a wash. Best of all, there will probably be leftovers, so when you're late after searching for clean socks, you've got the next day's lunch all ready to go. We're assuming you already have sea salt, Sriracha, 2 to 3 sweet potatoes, paprika, and 1 cup uncooked rice, but if you don't, add those to your list as well! With an hour to dinner, bring the 1 cup of rice, to a boil in a pot with 1 cup coconut milk and 1 cup of water. Reduce the heat, cover, and simmer for 15 minutes. While the rice is cooking, preheat your oven to 400° F. Combine 1/3 cup melted coconute oil, 1 tablespoon Sriracha, 1 teaspoon sesame, and 2 tablespoons tamari in a jar (with a lid), and shake to emulsify. Cut up the 2 to 3 sweet potatoes and place them on a baking sheet. Drizzle with some coconut oil and 1 teaspoon of paprika, and toss to combine. Put it in the oven to roast for 30 minutes. When the rice is done, remove it from heat and keep covered. As the potatoes are roasting, place the kale and 1 cup coconut flakes on a separate baking sheet, and drizzle with about two-thirds of the dressing. Add the salmon filets, topped with 1 to 2 tablespoons of the dressing, and place them in the oven, with the potatoes, for the last 15 minutes. Watch the kale to make sure it doesn't burn. At the end of the half hour, remove both sheets from the oven. Top the sweet potatoes with the kale, coconut rice, and the salmon, and drizzle with the remaining dressing. Enjoy! This article orginally appeared on December 8, 2015. We're re-running it because it's exactly the kind of easy, filling dish we want to eat right now. As a nutritionist, I use kale quite a bit in dishes, which my husband and daughter were not fans of until I made this recipe. This is a great dish. The kale, sweet potato and coconut rice go really nice together and the kale alone is bomb. "We're assuming you already have sea salt, Sriracha, 2 to 3 sweet potatoes, paprika, and 1 cup uncooked rice, but if you don't, add those to your list as well!" Y'all are assuming a lot about me. Looks good, though. this recipe format is maddening. i would prefer if it was written in a normal format. This is the bomb. First, I love that this recipe is an all encompassing meal - rice, sweet potatoes, kale, and salmon. You don't need anything else. Wait...untrue. A glass of white wine and you are good to go. The rice is great with good flavor and easy to put on the stove and forget about while prepping the rest of the meal. (I used Brown Jasmine rice because I didn't check my pantry before going to the store; it worked fine, I added maybe an extra 10 - 15 minutes of cooking time.) To save on dishes, I put the potatoes on a foil lined tray. When it was time to bake the kale and salmon, I squished the foil to one half of the baking tray, and lined the other half with foil for the kale and fish. Yes, everything on one tray. (o: The dressing is incredible; umami with a salty, spicy zip. It wonderfully compliments the sweet, caramel-y potatoes, creamy coconut rice, earthy kale, and meaty salmon. Make this recipe. You'll love it and dream about when you can make it again and again. I can't believe this recipe has no comments - it's one of the best salmon dishes I've made or tasted.